There are of course fewer phone boxes on our streets, for obvious reasons. 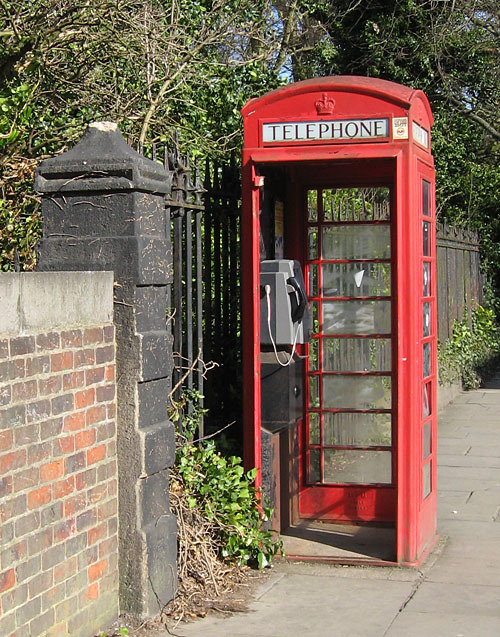 English Heritage records show that a few of the red phone boxes in York have a Grade II listing, which presumably prevents their removal in the short term at least. But this one, on Bootham, isn’t listed. I’ve been expecting it to disappear sometime, that I’d walk by one day and find BT had just carted it off to the phone box graveyard (in Newark, Nottinghamshire, apparently). Instead its dismantling seems to have happened in a more piecemeal and ad hoc way, as it’s now missing its door. Where the door went I don’t know. It might have been thrown over the wall nearby. The adjoining stone corner post used to have a stone ball finial, I think, and now doesn’t. It may have been knocked off by a passing phone box door being thrown over the wall towards the railway line below. Just a guess. But then phone box doors are heavy and hard to lift. Which also makes it unlikely someone would just remove it and carry it home. Anyway, this phone box now has no door. It has been vandalised at regular intervals over the years, gets cleaned up and repaired a bit, but I doubt BT will supply a new door. I do see it being used occasionally, which is always rather a novel sight. And strange to think how utterly crucial to social life, to relationships, these phones once were. The railings behind it are the boundary to Bootham Park, where a homeless heritage project did an archaeological dig in recent years. One of the films from the project mentioned a ‘phonecard’ among the 20th century finds. A phonecard. Probably 20 years since I’d heard the term, or thought about them. It sent me right back to the late 1980s, their vivid green, their immense importance in my communications with friends and family, particularly during my university years. I think phonecards may even have been useful presents, back then, for students like me, given by family members to help/encourage us to keep in touch. Now we’re constantly in touch, messages and calls zipping endlessly across the ether, and the idea of standing in a box in the street seems strange and quaint and silly. Even more so in this one, now it has no door. I’ve always liked this phone box being here, particularly the view when coming home from town in summer when the trees in Bootham Park and along the railway line and in front of the Churchill Hotel are in leaf, so much green, and then there’s this bright red punctuation mark. And in autumn, with the copper beech at the Churchill seen behind it. But like all things it will pass. Or rather, be taken away by BT or one of its contractors. Perhaps if it were nearer the town centre, in a busier place, it wouldn’t have been vandalised so much. It would probably still have its door. I’d rather it stayed here, enhancing further already beautiful Bootham. But perhaps it needs rescuing and relocating. How about Kings Square? About to undergo a makeover, and currently home to those ugly modern phone boxes covered in garish colour. It could have a new door, and a new coat of paint, and stand next to the red postbox there. They could live out the remainder of their useful lives together, these familiar icons of the British streetscene. 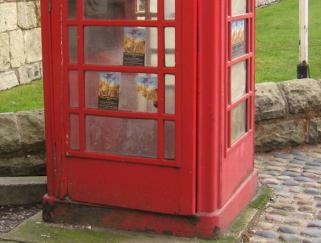 The title did mention two phone boxes. The other is the Marygate one, which had its own page some months ago. York Museums Trust or York Theatre Royal could perhaps have cleaned up this advertising, or paid for someone else to do it. It’s now eight months since the advertised event finished. I tried to remove these ads but couldn’t: they’re stuck to the panes. There’s no reason BT should deal with it. They’re losing money on these phone boxes already, keeping them in place. Fibbers or the Duchess could no doubt benefit from plastering these panes with fliers, but they haven’t. Wouldn’t blame them if they did, as it appears to have been endorsed as a legitimate form of advertising by prestigious local cultural and heritage organisations. York Theatre Royal have said they’ll have a look and see about removal. By Lisa @YorkStories • 19 April 2013 Streetscape To link to this page's proper location please use the > permalink. One in Settle has become an art gallery, while others house defibrillators. Use it or lose it. 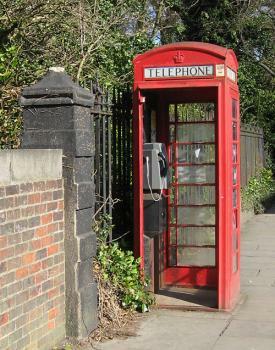 Freephone calls to 0500,0800 and 0808 numbers generate 49p per minute for BT payphones and counts towards annual usage. Why pay up to 40p per minute to call a freephone number on a mobile. The first kiosk will not be removed as like you say it gets used at least 2 to 3 times a week or month and I am guessing the next nearest BT street payphone is likely to be more than 400 metres away. BT and kingston have an unenviable obligation to provide you with a phone service including a public payphone. if you would like the door to be replaced and the kiosk repainted you could drop BT payphones an email which is what I did to one near me, they replaced the door and painted them and now they all look like nice and guess what people have actually started using them more often! I will contact BT as you suggest. Last time I passed it was still missing its door. Thanks for the suggestion, and for letting me know of a positive outcome for another doorless phone box! I should also mention that since I wrote the above the Marygate phone box has been cleaned of the advertising stuck firmly to its panes. I’m not sure if it was someone from the theatre/Museums Trust, or BT, but good to see.